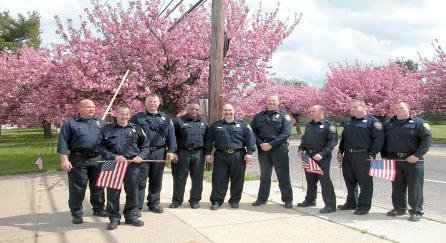 Cherry Hill's - "9-11 Remembrance & Patriotic Gratitude"
Welcome to Cherry Hill's - Cherry Blossom Web Site! You are invited to participate in Cherry Hill's "9-11 Remembrance & Patriotic Gratitude" event that occurs in the last two weeks of April. 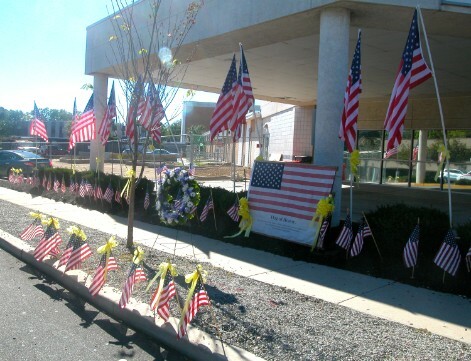 If you visit Cherry Hill to observe this event you will see Chapel Avenue's beautiful two-mile avenue of blossoming cherry trees adorned with American flags and yellow ribbons. The reason Cherry Hill observes a "9-11 Remembrance" event in late April is because of the millions of cherry blossoms arriving in Cherry Hill during that time frame! 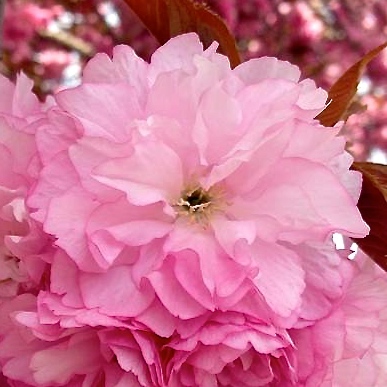 The cherry blossoms annual arrival creates an impressive Spring spectacle for everyone to witness and enjoy! This flowery presentation, from the hundreds of blossoming cherry trees that are adorned with American flags and yellow ribbons extending along a two-mile avenue, is a proud and visual statement of Cherry Hill's homage to America, our military and to the remembrance of the tragedy of September 11, 2001. 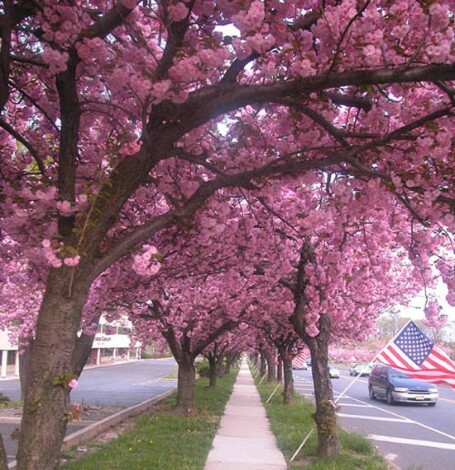 This two-mile patriotic cherry blossom avenue is the very best that Cherry Hill has to offer to reflect our solemn remembrance of September 11, 2001 and love for country by the townspeople and community of Cherry Hill. You can attend our "9-11 Memorial" ceremony or just drive through Chapel Avenue's two-mile avenue of of blossoming cherry trees as proud Americans in remembrance of this tragic event. Offer a silent prayer as you drive through for the victims of September 11, 2001. American flags and yellow ribbons are placed onto the blossoming cherry trees to reflect a community-wide homage for the victims, their greiving families and proud support for our military. 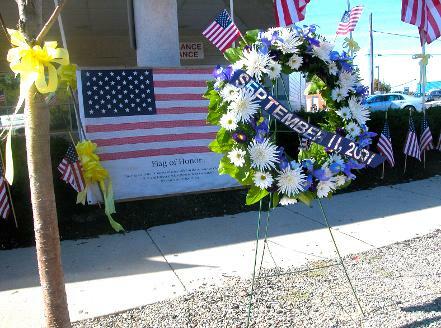 This patriotic avenue calls on the full community of Cherry Hill and all Americans to come together to "remember and never forget" what happened on September 11, 2001. Families are encouraged to bring their children so that they too can participate in this solemn homage! It is a great opportunity to teach our children a lesson of compassion, patriotism and proud support for country. The children can place a flower at the "9-11 Memorial" site or even bring a small American flag or yellow ribbon to place around one of the cherry trees. Explain to the children why these blossoming cherry trees are adorned with American flags and yellow ribbons and what our country stands for! Teach them to be proud Americans -- don't let this opportunity slip by! Attending our "9-11 Remembrance" can be a meaningful experience for all members of the family! This "9-11 Remembrance" event has been presented by Cherry Hill's Firefighters and the American Legion Post 372 War Veterans for the past nine years. On the anniversary of September 11, 2001 - another "9-11 Memorial" site is set in front of Kennedy Memorial Hospital on Chapel Avenue by these two groups! 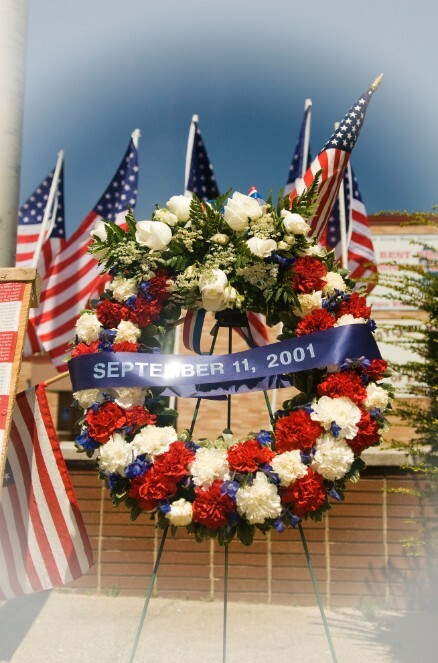 A "9-11 Remembrance" service is held and attended by all who wish to participate. There are no cherry blossoms present in the month of September. Young and old alike will enjoy seeing Chapel Avenue's patriotic avenue! All who attend Cherry Hill's "9-11 Rememberance & Patritoic Gratitude" service will feel a warming sense of patriotism and pride to be an American! The "9-11 Memorial" service ends with the singing of "God Bless America" by all people attending the service. 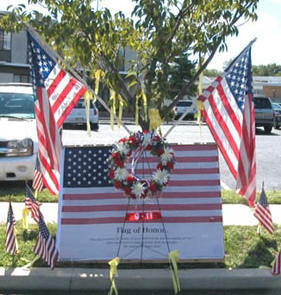 A "9-11 Memorial Wreath" is placed at the "9-11 ceremony site -- surrounded by American flags and yellow ribbons. The "Flag of Honor" (below) is an American flag that bears the names of the 2996 innocent victims who lost their lives that day. The names appear in the red and white stripes of the American flag. This flag is a sobering reminder of what happened on September 11, 2001. An horrific event that forever changed the "America" we loved so much! On the anniversary of September 11, 2001 -- a "9-11 Memorial" display is set up in front of Kennedy Memorial Hospital! Large and small American flags are placed on the cherry trees on both sides of the display! A solemn service is held in remembrance of the 2996 victims that perished on that fateful day. Families are encouraged to bring their children so that they too can participate in this solemn homage! It is a great opportunity to teach our children a lesson of compassion, patriotism and proud support for country. A single cherry blossom photo taken from a cherry tree on Chapel Avenue! A drive through the cherry blossoms - a beautiful patriotic avenue of blossoming cherry trees, adorned with American flags and yellow ribbons in a solemn remembrance of September 11, 2001.!